Plastic is so difficult to avoid as it is EVERYWHERE in our environment. Can you think of a day where you didn’t come in contact with plastic? Straws, packaging - food, merchandise, shipping, kitchenware, parts, drinking containers, you name it! Long gone are the days of paper bags and glass reusable containers. At The Pet Beastro, we want to do our part with helping the planet. This coming Earth Day, April 22, 2019, is our cut-off date for joining the movement of no more plastic!! This past Christmas at our family’s Secret Santa exchange I asked for reusable silicone “Ziploc” bags, beeswax wrap (to replace plastic wrap) and mesh produce bags (so I don’t have to use the plastic ones at the store). Once I opened them, everyone was so intrigued by my requests. Isn’t it funny how something so basic becomes “you’re so hippy-crunchy” simply because we are all so used to overuse of plastic that it no longer becomes a concern to the masses? Currently, in the United States, there are cities and counties with plastic bag bans and fees. I applaud those areas who are making a bigger impact and awareness of our over-consumption and use of plastic. If you are headed to Boston, Chicago, Los Angeles, San Francisco, Seattle, Boulder, Ne York, or Washington D.C. anytime soon you might not be able to get a plastic bag or may incur a fine or usage fee for taking something home in plastic. If you haven’t heard of the Great Pacific Garbage Patch just yet, I would encourage you to do a quick google search or check out the website www.theoceancleanup.com. It is a large patch of plastic garbage that has reached our sea waters between California and Hawaii which measures 1.6 million square kilometers which is estimated at 80,000 tons. With those huge discouraging numbers, the most encouraging part is that people are literally cleaning it up with boats, nets, and new floating technology to scoop it all up! If you visit www.earthday.org they have some staggering numbers posted on our over-consumption of plastic. The benefits of using reusable bags are just as jaw-dropping. Will you help us with our movement and support our small part to reducing plastic waste? I know it’s part of forming a habit and we want you to encourage you to use reusable bags wherever you shop. We were very mindful when we put our bags together and designed them. We wanted to make sure they were wide for larger items, could hold the weight of frozen pet foods, can be wiped out if something spills or leaks, and infused with quotes for health and wellness. You can purchase one of our reusable bags during the entire month of April 2019 for half price. 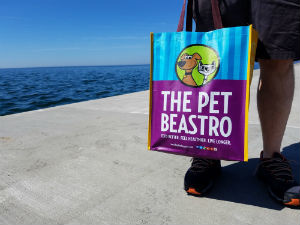 Every time you use your Pet Beastro bag, you can earn a $.20 cent credit on your purchase or $.10 cent credit for using a bag you may already have! There is no better time than now to step it up and help our planet!